We will have Ayambil on all 9 days at our temple between 12 and 1 pm. Please come to Derasar if you are doing Ayambil, we have many volunteers making Ayambil food for tapaisvis. Please bring your own boil water. Ayambil Sponsorship for all 9 days is only $101.00 each, we need Volunteers for all 9 days, greatly appreciate your RSVP. Please contact Vaishali Chheda at vaishali.chheda@gmail.com for sponsorship or any questions. Ayambil Oli is a festival of 9 days celebrating and paying homage to the Navpad (The Navpad are also found in the Navkar Mantra). Nava means nine in Sanskrit and Prakrit languages and Pada means post. Hence the word Navapada means nine supreme posts of the universe. These nine are Arihant, Siddha, Acharya, Upadhyaya, Sadhu, Samyak Darshan, Samyak Gnan, Samyak Charitra and Samyak Tapa. 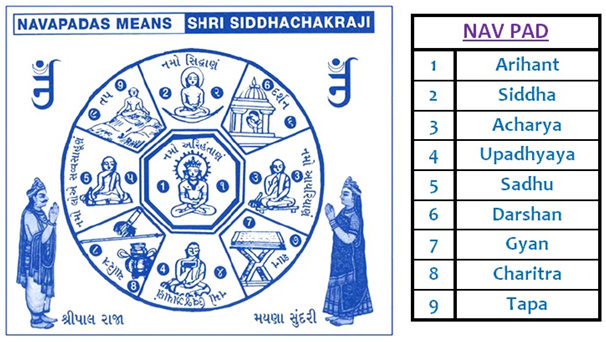 Jain literature (Kalpasutra) indicates that Navpad Oli is Shaswati, meaning permenant. Navpad Olifestival exists in all time cycles (past, present, and future). This provides significant important to the Navpad Oli. The story of Shripal and Mayanasundari are connected with this observance.